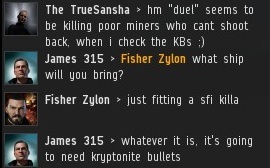 When CCP decided to make highsec safer for miners by eliminating the can-flippers, they unintentionally removed the mechanic by which players duel--to humorous effect. In a subsequent patch, they added a special feature just for dueling. 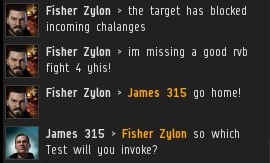 Enraged by watching me bump miners, Fisher Zylon challenged me to a duel. Many offer such challenges, but once accepted, few go through with it. 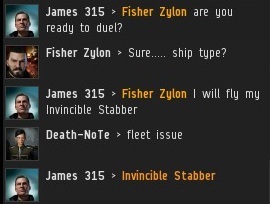 I have flown the same Invincible Stabber since I purchased it in June of last year. It is often engaged in combat, but has never been defeated. The situation became increasingly hype. Everyone in the system wondered if Fisher could rescue the Code-violating miners. In an act of supreme honour and transparency, I linked my ship fitting. My ship is designed for bumping, but is not entirely without weaponry: It is equipped with a Civilian Light Electron Blaster. Fisher did not return the favor, opting to keep his ship and fitting a secret. 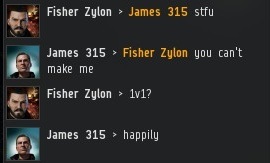 He intended to gain the advantage by designing a combat platform specifically to counter my ship. 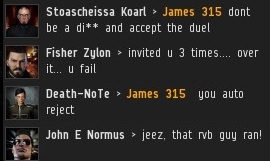 Sensing my confidence, rebel fan Stoascheissa Koarl became nervous about ways that I might "cheat" the duel. The stage was set for an epic duel. The stakes couldn't be higher: If the Invincible Stabber were to be destroyed, miners could violate the Code with no fear of bump. Fisher and a few of his friends were waiting at the designated area. Fisher flew a Hurricane, likely equipped with ammo to exploit the EM hole in my shields. It was unclear what tank he might have fit to counter my civilian blaster. I eagerly awaited Fisher's invocation of one of the three Tests which, upon completion, entitles one to a duel under the Code. ...But Fisher seemed reluctant to proceed. Upon realizing his oversight, Fisher was enraged. 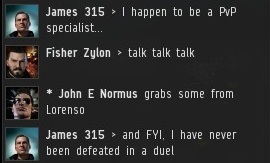 He withdrew, leaving the Saviour of Highsec to hold the field. The bumping of miners could continue. Fisher had no intention of invoking one of the three Tests, no doubt due to fear of failure. He vowed to avenge the miners by suicide ganking me--a vow which he still has not even attempted to fulfill. 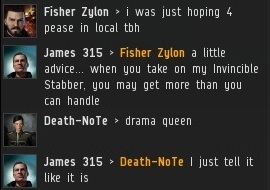 As is to be expected, the locals indulged in a bit of Monday-morning quarterbacking on Fisher's inability to destroy the Invincible Stabber. The question remained: What would happen if someone did manage to secure a duel? Next time: A duel actually occurs! Fisher was wise to up-ship into a Hurricane... but even that wasn't enough to defeat the Invincible Stabber! I've long waited for a successful invocation of one of the tests outlined in the code. Can't wait for the next chapter. This is gold, pure comic gold I tell you! I shall name my new Stabber 'Test of Wisdom' in honor of the Savior. What does each test consist of? "Q. 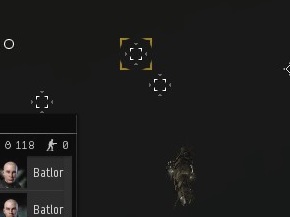 If you're invincible then meet me in [lowsec system] for a 1v1. Test of Fortitude. Walk a mile in the Supreme Protector's shoes by becoming a miner-bumper. You must continue to bump miners for an indefinite period of time." If you challenged Roger Federer to a tennis match and he declined on the grounds that you weren't worth his time, you wouldn't be justified in calling him a coward for it. 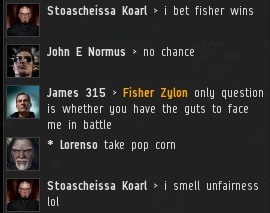 Cowardice in EVE online is when someone won't fight you when you know your fit/fleet comp is a hard counter to theirs, or you outnumber them 3 to 1,etc. It has no real meaning: except when someone posts anonymously while calling someone else out for cowardice, that's real cowardice. Supreme Protector best writer. Can't wait for the next episode! "grammer" is not a word. IM TIRED OF BEING CRITICIZED BY A BUNCH OF NITPICKING NERDS... IM GOING TO A COMIC BOOK CONVENTION! Ha! Anonymous @ 5:05 used an informal manner of speech common among Americans, where we drop the 'I' at the beginning of a sentence, implying the 'I' based on context. Anonymous @ 7:25 is just an idiot. Thanks, I'm Anon 5:05... I'm not American nor native english, I used that form because I'm used to it after learning English in forums and videogames. Thanks for your clarification on the origin behind it. By the way, the important thing is that Miner Bumping is a great blog full of fun and reason, and the agents ar just as fun and reasonable. 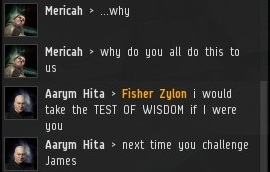 EVE is a better place thanks to you!